Public Works and Transport Minister the Hon. Neko C. Grant addresses participants in the Family Island Transport Enhancement Project workshop. Works director John Canton is seated the table. Nassau, The Bahamas – The Bahamas Government in collaboration with the Caribbean Development Bank (CDB) officially launched the Family Islands Transport Enhancement Project during the opening ceremony for a workshop for stakeholders on October 14. In attendance were Minister of Public Works and Transport the Hon. Neko C. Grant; Colin Higgs, permanent secretary; John Canton, director; engineers; CDB representatives and a wide cross-section of stakeholders. 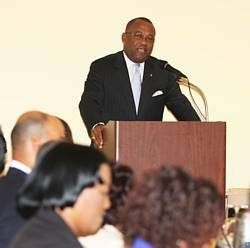 A $10.1 million loan agreement was signed between the Bahamas Government and CDB during the 40th annual Caribbean Development Bank Board of Governors meeting in May. The loan enables the Government to execute infrastructure projects including the reconstruction of Three Island Dock in North Eleuthera, the reconstruction of Fresh Creek Dock in Central Andros, rehabilitation of Deep Creek Bridge in South Andros and rehabilitation of Little Creek Bridge in South Andros. A technical assistance grant of $37,000 from CDB will also facilitate preparation of feasibility studies and designs for new commercial ports in Abaco and Great Exuma, a new North/South highway in Great Exuma and a road link between Little and Great Abaco. Among others, the workshop covered legal considerations relating to the loan, disbursement policy and procedures, project implementation arrangements and descriptions of roles for government officials. Mr. Grant described the project as “timely”. 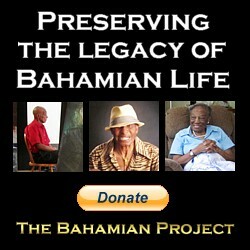 He said it will provide direct employment for Bahamians, Family Island residents, in particular. As an archipelagic nation the roads, bridges, docks and ports provide vital transportation and communication links within and between islands, Mr. Grant said. “They facilitate the provision of basic services to residents. They also facilitate increased economic activity in tourism, agriculture, fisheries and other sectors on these islands. Mr. Grant thanked the CDB for its support in financing the project and for hosting the workshop. Speaking on behalf of the Ministry of Finance, Simon Wilson, director of economics and planning, said the Ministry is fully committed to the successful on-time and on-budget completion of this project. Andrew Dupigny, of CDB, said it is expected that project stakeholders will be empowered with a greater understanding of the project timing and the inputs that will be necessary to achieve the project’s objectives. “It is our hope that this workshop will give us the opportunity to discuss and devise solutions to overcome those constraints which we are able to identify,” he said. The project is to be implemented over a 17-month period. A project coordinator will be appointed to report directly to the Director of Pubic Works on project activities.